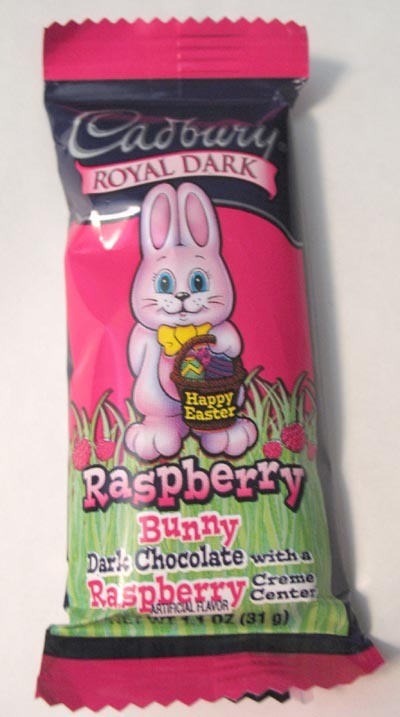 Another day, another raspberry and chocolate Easter candy, this time from the folks at Cadbury. I picked this bunny up at the local Walgreen’s while trying to find another Raspberry Whip Egg that I reviewed yesterday. The Easter candy selection at the store is very limited, and this was the closest thing I could find. While the packaging says that it has a creme center, it is in fact more like a liquidy-gel. There was nothing creme about it. Expecting a creme center, I took a big bite out of the bunny and was surprised at how liquidy it was. It reminded me of the old Chewels gum which I used to enjoy. Overall, this bunny is very good. 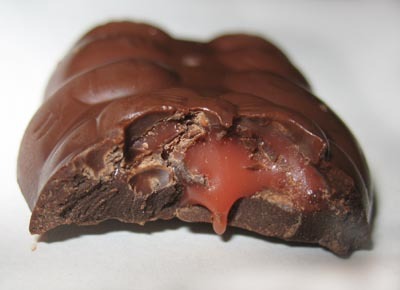 The dark chocolate was smooth and not too bitter, and the raspberry center, while liquidy, was still very delicious. What Easter Candy Are You? Which came firstâ€”the chocolate chicken or the chocolate egg? Yum. Come on over and check out my fun, all-inclusive ode to “eating bunnies” post, which includes this item. What is 14 + 13 ? IMPORTANT! To be able to proceed, you need to solve the following simple math question.